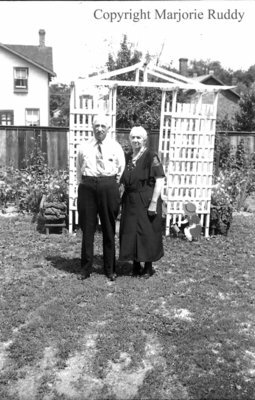 Black and white negative of James and Alice Sawdon standing outside in front of an arbour. A wooden fence is visible in the background. Thomas Sawdon (1833-1916) married Harriet Boddy (1834-1916) at Yorkshire, England in 1858. In 1882 they immigrated to Canada first settling at Alliston and then moving to Whitby in 1905. Thomas and Harriet had six children: Mary, Elizabeth, James, George, John, and Thomas. James Sawdon (1863-1947) married Alice Read (1863-1943) of England at Whitby in 1887. They had two sons: William James Jordan Sawdon (1895-1963) and John R. Sawdon (1900-1975). James opened a coal selling company, James Sawdon & Sons, in 1914. His sons continued the business following his death. James Sawdon & Sons was located at 244 Brock Street South. James and Alice Sawdon, July 16, 1939, Marjorie Ruddy. Whitby Archives A2013_040_810D.